Mangrove refers to both a habitat type in the intertidal zone and to the specialized, salt-tolerant trees and shrubs that grow there. Approximately 75 percent of coasts located between 25° N and 25° S support—or did support—this vegetation type. Mangroves grow in both wet and dry climates within this latitudinal belt. Mangrove habitat is found on river deltas that form in brackish estuaries (riverine mangrove), on intertidal flats along more exposed coasts (fringing mangrove), and on the landward side of fringing mangrove where wave action and tidal influences are greatly reduced (basin mangrove). Mangrove (plants) occur in at least 19 plant families. Two stand out: the black mangroves (Avicenniaceae) and the red mangroves (Rhizophoraceae). Two genera (Avicennia and Rhizophora) occur throughout the tropics. Most others are geographically restricted to the coasts of either the Indo-Pacific region or the Atlantic Ocean. In desert areas the mangroves are low shrubs, but in tropical rainforest areas they can be trees 120 ft or more tall. All have evolved ways to tolerate waterlogged soils and high salinity. To overcome the constraints of a saturated substrate, many produce some kind of aerial root (pneumatophore). Black mangroves produce thin, vertical projections from their roots that are completely underwater when the tide is in, but exposed to the air at low tide. Red mangroves have prop roots arching from their trunks to the ground. In both structures, pores in the surface allow air to penetrate to the underground ground roots during low water levels. Strategies to deal with high salinity are similar to those found among salt marsh plants. Some, such as Rhizophora, prevent salt uptake by their roots. Others, such as Avicennia, allow salt to enter the roots but have salt glands on their leaves to rid the plants of excess salt. A few species allow salt to accumulate in bark and leaves and then shed these tissues to eliminate excess salt. The embryos of many mangroves develop while the fruit is still on the tree (vivipary). The resulting seedling or capsule looks like a long bean pod hanging from the branches. Seedlings drop from the tree into the water and float for weeks until they reach sites favorable for their further growth. In the Americas, mangroves are usually arranged in three zones. Red mangroves prefer the seaward edge of the stand, black mangroves grow inland of them, and white (Laguncularia racemosa) and button mangrove (Concarpus erectus) concentrate at the landward edge. Sessile barnacles and oysters attach to mangrove trunks and aerial roots, on which periwinkles, snails, and tree-living crabs feed. On the floor of the mangrove, fiddler crabs, mangrove crabs, snails, and air-breathing mudskippers find a home. The invertebrates aerate the soil as they build burrows and mounds and thereby improve growing conditions for the plants. Mangrove leaves are rarely consumed by animals, Borneo’s proboscis monkey being the main exception to the rule. However, flowers and fruits attract an array of insects and other terrestrial animals. 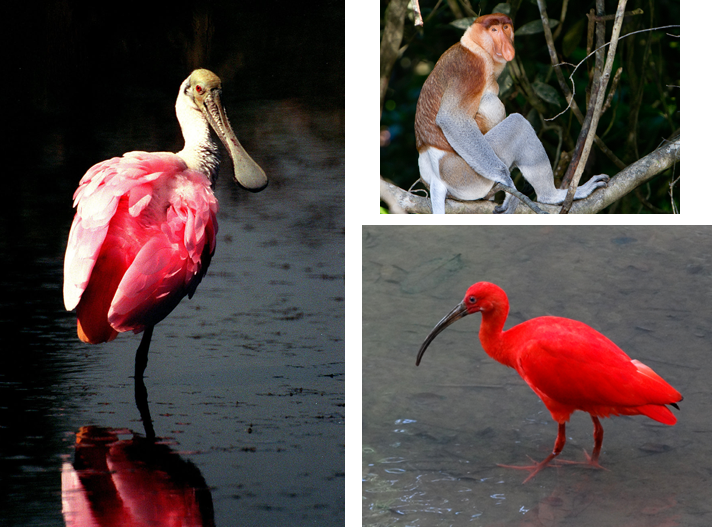 Wading birds such as Scarlet Ibis and Roseate Spoonbill, probe the floor at low water; fish are predators hunting during high water.